The new year is coming. And some part of me is bringing up the 'the most ideal thing is an empty room' feeling again when I get stressed. As in, everything put away, clean and organized will help... but it doesn't. I've grown a lot in the last decade. So, some actual thoughts and goals, instead of the unhealthy ideas. Books! I have lots of books to read... but that time isn't always on the board. I have really enjoyed reading this past year because I've not really set any goals, just grabbed the next thing that looked like a good *cheap or free* read when I finish the last thing. Knitting - have several projects out there and could work on them some. I made some progress on the big blanket and added a few rows to my shawl so that it ties behind my back. The Christmas yarn is coming along nicely will probably need one more of those to make that shawl/scarf piece useful once it is done. Sewing - My table needs to be organized again... make use of scraps. I have my embroidery project finally dug out again and maybe I can get something done on it before it gets ruined. On second thought I should just put it away. I need to reduce but then I can never find what I want to complete a project either... admittedly not always because I don't have it- but sometimes that is the case. I feel the urge to buy another yard and a half of fabric and make new pillowcases again. Writing: Been getting there.. doing more of it. Diet - Holiday food has been too tempting.. so much food. What happened to vitamin C and vegetables? Garden - To do or not to do? Should I start seedlings, look at seeds.. or decide that the garden probably will not work out and let it lay fallow for an entire year like we had discussed doing (and didn't) last year. A neighbor of ours had another grandchild - and I was inspired and feeling a little bad that I didn't know they were going to have their second so soon (I'd seen her, registered it, but not how long)... so I did some sewing. A stack of burp/change cloths and a dog toy for his older brother. The dog is built from the Purl Soho Pup pattern - which I actually almost followed to the letter. I hardly ever use anyone else's toys patterns... but I liked the gusset on this one 'bottom of body' they call it. I'll probably size it down next time I make it.. this was full size from the PDF. Esme did a little cooking (with our help) from her Christmas gift cookbook. Bacon wrapped hot dogs. Enough grease to kill a horned endangered beast.... but I served that with apple for lunch. And now Mark is working on a project downstairs. Esme is coming to terms with her friend not being available to play with today... and I'm tired. I sat in the sun on the bed and knit about three rows. But I think I might have to take a nap. I close at the store tomorrow and then open the next day... but I agreed to that, so someone else could switch shifts. The acrylic yarn Mark and Esme got for me for Christmas. I'm working it up in a seed stitch. Some cleaning up. We braved town a little today. Mark wanted orange juice, and I wanted to get some fabric for a baby gift. Esme was all into activities this afternoon once we got back, Frisbee and Minecraft. I had a few bouts of vertigo again (had one yesterday but it went away and didn't return). Frisbee and picking it up off the ground over and over did it. But, finally sat down and got out the little burp cloths I had decided to make. Might make something else tomorrow - the baby has a toddler brother that will be left out, otherwise. Mark gave all the dogs their baths - quite a feat. Nova was NOT wanting hers.. but we finally found her and she grumped through the whole thing. Started on the second book of the Murray series by Hannah Howell. I have a few other things downloaded, too. I have one more day off then work until the weekend. I had planned on getting this for her a good while back. Kitchen accessories, blender, mixer and coffee pot, on top of the kitchen set. This was a little set I got her from Grandma so she could play with making recipes. The little fox and a stuffed pony were in her stocking. She got an old fashioned cookbook for kids and nice clothes, too. Kitchen kit. Daddy said: 'Do the Vanna White thing. This is the kitchenette I built for her last month and had been keeping under a sheet since then. It has a little faucet and sink and a play stove with an oven. There is some storage under the sink. It is tall enough for her to play with and on wheels so it can be moved around. Grandma got a shawl and a kitchen faucet which I will install. Esme found her a pretty keychain. I hope Grandma liked the things we chose for her! Mark found me some fuzzy pants with tyrannosaurs on them! Awesome. And I'm already working on the beautiful yarn they found for me. Mark made lasagna. It was quite good and heavy. We watched a few Christmas movies, and then after dinner Spud decided that we had to go for a walk. So, Esme took Lucy, I took Sweetie and Mark took Spud all on leashes down to the lake for a walkabout. I can clean up the next few days and organize some. With having the migraine a few days before Christmas and then having to work Christmas Eve, the house kind of needs a going over. Its Christmas Eve. The secret toy is waiting to dry from one last coat of paint (and a stabilizing fix since a cat had jumped on it). The stockings are hung up by the tree on a cord, and I'm waiting for sleep to settle over the house so I can fill them. We baked hazelnut cookies and the reindeer have eaten one downstairs. Esme is in bed. I hope everyone has a lovely time with their families! I am grateful to be able to rest at home that day and be with mine. Two days of migraine have come and gone. I read a few books (when I could, with the Kindle font set up to 'huge' during some of it), and wrote that short story. My brain has delivered me odd dreams as fodder for a few more, or to add to my novel I am working on. I published the first chapter of my novel I was working on as well... it got seen some. I finished the little fox toy I had been crocheting and finally dug my sewing machine out from behind the secret toy project to hem up some pants for someone at work. Just a few days left until Christmas. Had a very nice talk with my parents online last night - but 'Oceanfront Property in Arizona' song is still going through my head. heh. Mark has been up cooking since nine this morning. I slept in. He has made the sauce and Esme and him just began to make the meatballs for our Lsagna on Christmas. Mark said it was toasted bread crumbs, paprika, salt, pepper , onion powder and a little over a pound of thawed 90/10 ground sirloin. He'll bake them in the oven a bit and then put them with the sauce when the meat in it is more tender. Esme helped him roll the meatballs up and put them in the pan. She said it felt yucky. And everything Esme does is on wheels. I slept in this morning, the first time in a long time I've been able to do so. And of course, my brain had to take off on some deep philosophical jaunt. I got a somewhat creepy short story out of it, though. 'House of Sunlight', which I published on Niume. The story is actually the combination of three storyarcs that were in the dream, and as dreams do, weren't entirely connected. But I was able to somewhat draw them together into one. I am finishing up reading my book today and trying to stay warm. I was so very very cold at work last night I had to go put my hat and scarf on inside the building for a while. Mark says it will warm up soon! But, to see Esme dancing in circles through the flashlight beam as the world glitters in every molecule around her wherever the light touches in the darkness... I will remember that one for a long time. Click to see the picture full size and zoom in. It's worth it. Esme's Christmas party and drama program was this morning. I walked her to the school bus and then got myself ready to go and meet her at her classroom at 8:30. I was just a few minutes late - as the parking lot was FULL and I had to drive around the block. The door was closed when I got to the classroom - carrying her little exchange bags and the gift for the teacher - but when a grandmother came up right behind me we both decided to open the door. There was Esme and her classmates dressed in reindeer antlers. They were doing their little dance routine as the reindeer in the LeRoy the RedNecked Reindeer program their teacher had worked with them on. They even did a line dancing routine. It was very cute! Afterwards Esme told me she was just about to maybe cry because she didn't think I was coming, and then I came in the door. ;) We made it home afterwards and then Mark took me on to work. I made it through work (although it was FREEZING and I had to wear my hat in the store just to survive the night!). We stopped by the store and got a few last things before we came home.. now I have two days off. I'm reading the book 'Bedding the Enemy' by Mary Winn. Again, it is the characters that make it enjoyable, and the way they bicker and test each other while also supporting and protecting each other. After that, I have some 'cubist literature' stuff lined up... things to read while trying to decide where next to take my novel. Living with Catahoulas, you quickly learn they are timekeepers without watches. They know your schedule better than you do, and many of them are apt to keep you to it. This story is mostly about Lucy, one of our youngest Catahoulas. We have six Catahoulas (and a bluetick coonhound), and each person in the household has their own personal timekeeper (my husband has two!). This is a wonderful trait for herding dogs that were meant to bring in the cows and pigs at night, and bring them back out to the fields in the morning. They understand when something is 'wrong', and alert their people to things that are not following schedule. When things break tradition or schedule, they are genuinely worried and show their distress by nudging, whining and trying to tug or push their people into understanding what needs to happen that hasn't yet. This is Lucy, one of our youngest pair of Catahoulas, sitting at storytime with our daughter. But, in a household environment, large or small, a Catahoula timekeeper will be just as insistent. This is something to be highly aware of when you are training them - or else, they will 'train' you. There may be no 'livestock' to tend - but they will still insist that their people be up at a regular time, to bed at a regular time and if mealtimes stop happening at a regular time, they will make their thoughts known. Their aim is to keep everything running smoothly, as much as possible. Lucy is my daughter's dog. She assigned herself to that a young age, knowing that our poor Loula (who was hit by a car) had vacated the position and none of the elder dogs had filled the place. Catahoulas do this, too - in our experience. They fill niches and assign themselves responsibilities if their trainer has not laid out a specific set for them to learn. A Catahoula should not be left without guidance, either by an aware and observant trainer or at the very least, a stable environment and an elder dog that has been trained well. Once a Catahoula thinks you need something (which you may not), getting that out of their mind can be difficult! Best to train them up well and be aware that you are setting an example and training habits much like you would if a human toddler was watching your every move. Catahoulas are pretty high on the dog intelligence scale - they learn by watching us, and show great surprise when something goes against the habits they have learned. Lucy on her way to growing up. She has two blue eyes and a white with blue merle pattern. She is one of the more naturally shy Catahoulas we have, although she has had more success to leash training and dog park visits than her sister Freckles has. Lucy's self-assignment was endearing and simple. She would make sure our daughter went to bed on time, by escorting her every night along her routine and seeing her to her door. At that point she was not yet sleeping at her bedside. We encouraged this by making a large fluffy dog bed for her to sleep on in the bedroom. Esme, our daughter, encouraged this by reading a short bedtime story to Lucy every night after the rest of the routine, with her invited to sleep upon the pillow. And now, Lucy goes to sleep there at night, and rises with her every morning. Two sisters and a niece. Lucy is in the middle here, a puppy learning how to do things from her aunts. Lucy LOVES bedtime. That is said often in our house. She will come upstairs to us parents and poke our knees with her nose and turn in a circle - indicating something must be done. She will do this with increasing frequency as the actual hour of bedtime approaches (daylight savings time messed her up, as she is sort of sunset-based). She will continue to pace and bob between our daughter and us every fifteen minutes or so. When ignored she will sigh and curl up in a ball or place her nose on her paws at the exact place between us, ready to spring to action when we do. She puts on a very good 'depressed' attitude when bedtime is being later than she thinks, like on school breaks. When the routine does begin she guides our daughter through each step, pointing to the next thing and sitting in the hallway outside the bathroom. But Catahoulas follow our habits, as well as our schedule. This morning, even I was surprised. It is Pajama Day at school today. And our daughter was wearing her Pajama outfit to go to her class party. Lucy was confused. Normally Lucy has a morning routine she follows to the letter. She will get up, wait for our daughter to get dressed, and then she will be let outside the room and collect her sister to stand together and ask to go outside the house to the yard. Then they both return to the house and go upstairs to curl up with their mother on the couch. It happens this way so much I barely notice it anymore. But this morning, Lucy saw something that made her wonder, and she did not return upstairs. Instead, she came back and sat outside the bathroom in the hallway pointing at our daughter's room. Our daughter had eaten her breakfast and was brushing her teeth. Lucy walked up to her and traced her nose on the back of her knee, inspecting the pajama outfit. She then returned to her place in the hallway and sat. After a few moments I realized there were gears turning in that furry head. Lucy thought our daughter was going back to bed, and she was waiting for her duty. In her mind, she was still needed. Lucy (right) and her sister Freckles (above) with their brother Hunter. Freckles has assigned herself as 'Timekeeper in training for house activities' to my husband, understudy to her uncle Spud. Even funnier, was when I told her that no, in fact, she was not going 'bedtime', but to the school bus. Lucy pointed again - nose to girl - nose to bed, sit square on her haunches. I said it again, so she was certain, and asked my daughter to tell her as well. No Bedtime, School Bus. Lucy whined and turned in a circle. Then she went upstairs, but not to lay down. A moment later two noses poked around the bathroom door edge. She had gotten her sister Freckles to come see. I told them both - with more whining and doubletakes. Finally, they both went upstairs. I'm sure they were shaking their heads in dog language. We all had a good laugh about it - except the dogs, of course. So, Catahoulas are the timekeepers. But sometimes, humans do the strangest things, and even they don't know what to make of it at all. It's another reason I am so enamored of these dogs we have bred and come to know over the many years here in Tennessee. If you haven't had a pair of Catahoulas - (and one just isn't enough to see it all) - it really is a whole different kind of experience. It's been an eventful week. Esme got over her issue and went to school all the rest of the week - taking all of her tests. Then our car battery died, and we had a long ordeal getting that fixed (thanks again Irene for the charger). The holidays is a tough time to need someone to work on your car while you wait. But, today it was all fixed. I took Irene to the store and also dropped in at my store Christmas party. I bought Mark's Christmas gifts finally, and wrapped them when I got home. Now we have a new season of Outlander to watch on Netflix and cookies fresh from the oven. Esme and I will make her treat bags for her school party for next week before she goes to bed tonight. I've been reading a series called 'The Highland Brides', by Hannah Howell. It is another recommendation off the Outlander spinoffs. And - I am very well pleased with it. It has good historical storylines and complex characters that are not afraid to take the kid gloves off when arguing or stating their case. I read the first one : 'His Bonnie Bride' from the library and then quickly swooped in and secured the second one 'Highland Wedding' on the wait list. I actually read a good deal of that one while waiting for the car yesterday *ha*. Early tomorrow, work all through next week. But, Esme's party is on a day I work late - so we can go do that early with her. Snow is in the forecast for the weekend - and I am really hoping that does NOT happen. I realized, in my post about Sweetie, that I really don't give Daphne as much credit as she deserves. She has a different kind of quiet intelligence and a deep loyalty above all else. She is always happy and sweet, but not always understanding the breadth of the situation. Several times, though, when it got down to brass tacks, our Daphne has helped save the day. She was born in the Summer of 2012. She was so beautiful - with more white on her than we thought was possible in a Catahoula Leopard Dog. In fact, we read up on it and found that we should worry about her hearing, as part of her ears were white. In Catahoulas, the merle gene (blue eyes, 'blue' spotted coat) can cause deafness in some dogs. We knew we were going to keep Daphne, because we worried she might have a hearing problem and/or pass it on in her genes. Also, she was incredibly sweet. A ball of chunky puppy with one blue eye and one brown. She was 'White Ears' for about a month, until her name struck me. She was a little like Daphne, from the Scooby Doo gang. So, she has been Daphne or 'Daffy' (to my husband) ever since. Here she is one of several puppies playing tug of war with a rope with our daughter. The light just shined on her in this picture and she was looking at our daughter with adoration. One of our cats, a Manx calico, tried to adopt her at this time. She would stomp around with the puppy at her side leading her up and down our road. We called 'Mouse' the general and she was training Daphne up to follow her. She grew, and became longer and lankier, as Catahoulas do. This picture is her at about a year old, snuggled up against the cold weather on a beanbag. We were glad to find out she did not have a hearing problem, she just had a different personality than many of our other dogs. She likes to sit back and watch, and ask the other dogs what she should do next. She was Loula's right-hand dog, for the longest time. Sweetie and Spud were born about this time, and she was a loving big sister to them. I'll relate the tale of the goat again - because Daphne showed her true colors that day. We had a goat that had died of old age. We went to our local family that raises goats with Pyrennes and they recommended one to us that knew dogs and would live with them. 'Kitty' was well taken-care of by the elderly lady and adapted to our pack quite well, dancing and trotting along with the dogs up and down our road. For several months they treated her like a younger dog, taking her a bit further the longer she kept with them. We tried to keep her to a leash, but she often found a way out of it. Chewed collars and busted carabiner clips were a usual sight. One day, she went running up the road with the dogs and out of sight. Several of our dogs came back without the goat, but Daphne and her sister Loula stayed with her. We called and waited and even went through the woods, not sure where on our property they might be. Then, about eight o clock that night, as the sun was starting to set... here comes Daphne and Loula, one on either side of a seriously muddy goat, herding her along the road until we could come out and click a leash on her. She had obviously been stuck in mud up to her armpits, and they had somehow (we'll never know) lead her out and forced her to come home. It was quite a sight. And we were so relieved. They were both heroes that day - and the goat went on a lead after that when she wasn't in her pen. Daphne in the back, Lucy in the middle, Sweetie at the front. In the Fall of 2015, Daphne and Sweetie and Spud all chased the UPS truck. They escaped through the door before I could stop them - and they were off running. Spud came back that night.. but Sweetie and Daphne did not. We were very worried. We sent out calls to all of our neighbors and Facebook trying to see if anyone had seen them. We called the shelters and the sheriff, too. Sweetie came back on her own two days later - much to my relief. Daphne, though, was still missing. I gave up hope, until one day after Christmas - a very very cold day, a thin Daphne appeared on our road. back. She had been being kept on a leash somewhere - and her neck was a bit raw from straining against it to escape. My husband was very angry at this but we didn't know where she had been. We never found exactly who had tried to keep her ... she is a very pretty dog but they must have known someone was looking for her! We were so happy to have her home. I am so glad she didn't give up and found her way home. There's still one more 'hero' episode about our sweet Daphne - but I'll save that for when I tell about her younger sister Minerva, as she was the one saved. As I said, Daphne shows great loyalty and perseverance, and doesn't give up on her family. She definitely is a treasure. Sweetie is one of our set of 'twin' Catahoula leopard dogs, from the line we bred for four generations. Sweetie and Spud were born in the early Spring of 2013, so they are now coming on four years old. Catahoulas are pack animals, herding dogs meant for controlling cattle and pigs in the swampy woods of Louisiana. You might find them listed in some places as 'Louisiana Leopard Dog', or 'Catahoula Cur.' And they are a registered working class breed with the American Kennel Club. Having just one Catahoula you would miss out. They build on each other and cooperate in a way I have seen from no other dog breed. They are protective especially of other animals and children, and ours are only aggressive when they believe there is really a threat. It saddens me to see their aggression listed on the higher end of breeds... perhaps due more to their crowding of people and pushing them. Perhaps, being 'pushy' scares some people? Ours are very 'pushy.' Our newly moved-in neighbor once complained because four of our dogs surrounded their out-of-state relative and 'herded' them all the way back to their property line, then took off for home! In our experience each new member of the pack is trained by the elders and finds their 'niche' to living with their people. If not given one, they will find their own "job"and take their self-assigned tasks seriously. It would be hard to keep one in an apartment, especially alone. They are exuberant, and need lots of space, exercise and time with their people. This was Sweetie, as a baby. She has one blue eye, and one brown. Besides looking the most like her brother, she was also the smallest in the litter of ten puppies. She had a very sweet and 'dainty' nature, right from the start. She was 'the sweet one'. I couldn't think of any better name for her. It just stuck. .Puppies and the goat. We used to let the goat run free with all the dogs, but we had to put her on a long kennel run. There was an incident where Daphne and Loula had to bring her back from the swamp, where she had been mired for hours with mud up to her armpits. I was so proud of my girls that day, as we had no idea where she was and were growing worried as darkness fell. They were gone so long with her - we knew they were staying by her side. To this day, the goat has a cord she can travel along the entire length of our driveway as well as a small pen she spends the rest of her time in. And, she still thinks she is a dog, laying on the porch with the other dogs and running back and forth with them. The dogs know, but they don't tell her the truth. Sweetie and Spud as babies, at about six weeks of age. (see above and below) Sweetie was a bit more cautious. But together, they were brave enough to meet the goat. Being herding dogs, it is important they grow up with livestock from a young age. Spud (the brother) actually got close enough to lick the goat's nose. Sweetie and her brother, Spud, sharing secrets. All grown up, she is still the dainty one. One of the very 'Sweetie' things is to see her sitting somewhere, front paws crossed at the ankles, and surveying the other dogs with an air of dignified amusement. She believes she is 'in charge' and keeps our other dogs in line. She is the first to groom an ear, chide a barking puppy (her young nieces who are one year old, our last generation, which included the dog our daughter is training), or raise the alarm that someone or something NEW has arrived and must be barked at. She had decided, early on, that she was MY dog - or I was her human... either way. She greets me on my way in from work. She expects (with head on my knee and eyes closed) to be fed a morsel from my plate at the end of family meals. She gets jealous of the other dogs if they think they can get in line before her for a pet or a treat. She sleeps closest my bed curled up on my bedside rug or a small cushion in the corner of the bedroom. She thinks she knows what is best for me, and tries to keep me to a schedule. Often, she pokes her cold nose under my elbow if I am sleeping in late. Late at night when I haven't come to bed yet, and am up typing at the computer, she comes and bunts her long pointed nose under my knees to see how I am. If I don't pay attention sometimes, she tries to get herself under my knees and roll my chair to make sure I know she means business. Sweetie on 'alert'. On an excursion out to our west field, she was keeping her eye on her younger sister and our daughter at the same time. Sweetie really doesn't like the leash. She will walk on one, but only with her head hung low. Her brother is the 'town' dog who likes other people and being on display. Of the nieces, we have the same thing going on - one loves to follow people and do what they do, and the other would rather stay back and rule the pack and wait for the people to settle down to the homefires. Sweetie is okay with other people, especially children, but she is going to sit right by her people and keep an eye on everything for a while, just to make sure. She takes after her great-grandmother in that. Both sides of the Catahoula nature are interesting to see repeated through the generations. At times, we say the pairs we have kept are two halves of each other's brain - one outgoing and people-focused, and the other seemingly introverted, but actually the brains behind the entire operation. Although all of our dogs are now altered and there will be no more puppies we cherish each of the ones we have gotten to meet like they are family. 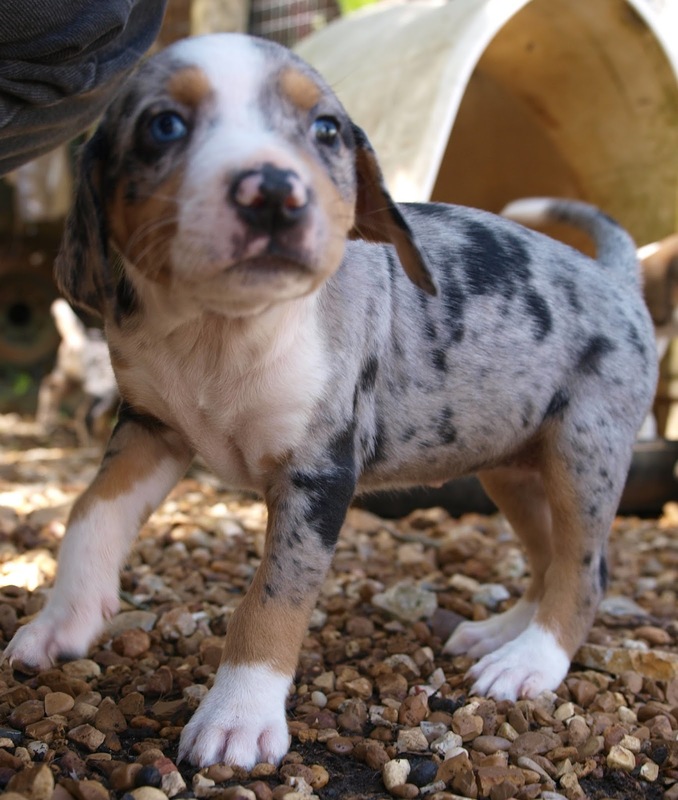 And our daughter has a Catahoula to raise now that is well-matched to her. That was important to us. I'll try to introduce you to Spud, Minerva, Daphne (and her sister Loula, who was killed by a car), Lucy and Freckles as the time goes on. Their great-grandmother was Misha, who we recently lost at the ripe age of seventeen. They represent the last twelve years of our lives here in Tennessee, in a way. They all have their own distinct personalities and stories. Well, I'm too soft. I let Esme stay home again today because she claimed her stomach really hurt... after being bouncey last night right up until the time she had to go to bed. But, it wasn't a fun happy day... she got castor oil, and told to go read half of her book... I was soft while I went to take a bath, because I was freezing. She played Minecraft then. And she's going tomorrow. There shouldn't be any further reason for tummy troubles "my stomach feels hard and bounces to my headache and back when I'm saddened" because the castor oil definitely did its duty. I happened to be making coffee in the kitchen and heard it from THERE. And she still ate lunch and dinner and said she felt 'just a little bad in the tummy' at bed, thinking more food would help. I said I'd be serving her breakfast in the morning before the school bus. She has a math test tomorrow, a science and social studies test the next two days after that. Then she will have a week off from school. So, *grant me some sanity please - I have one day more off on this vacation and its tomorrow*... I hardly ever got to stay home from school unless the situation was dire. I remember arguing to go to school one day around her age when I couldn't really walk - my reasoning was I wanted to go because I wanted to wear my blue velvet shirt that day. That was the day they told me the flu had paralyzed my legs temporarily. The argument was memorable in hindsight. And I was walking again before the end of the day.. which also in hindsight was lucky. That would seriously scare me to death as a parent and I know my mother was quite freaked out, too. But back then, I was just focused on not wearing my favorite shirt. I didn't get a lot done today, except for a little bit more on my next chapter written (just now) and a few sketches to keep myself oriented. I did read a book, while tucked into the bed ensuring Esme read hers. My hands are quite cold.. I actually tried to type in gloves. Didn't work. And I still didn't get a day so far to do Christmas shopping for Mark, or finish the secret project I started a few weeks ago. So I have to admit I was a bit irked about those things today besides the cold. I definitely wasn't ready to create an entire lesson plan when she skipped up to me at 9:00 am (after reading in her room for an hour or so) and said she normally had school from 8:30 to 3:30 and we needed to start on the educational things. I seriously doubted my earlier judgement call that she should stay home just then... *sigh* I made her do her math, took my bath, and then made her read for another two hours. Esme came home early from school today, saying her stomach hurt. I put her in a lavendar bath and then told her she had to sit in my bed under a blanket until her hair dried. She has been bouncy since, and eaten two meals... hope tomorrow we are good. Mark and I did just a tiny bit of Christmas shopping before we got the call... and we happened to be in town, so it was a quick trip over. I've done a little writing on Niume, a book review, a story about one of our cats, and a layout of a novel I've been trying to write for a year. I have 3500 words on it but have deleted more than twice that. Its going to be a dark psychological dream type theme and I keep telling myself to be less vague, less wordy and more upbeat. But .. that is killing it. So, I need to let it flow out and take my editor cap off. I did another chapter today and got some good ideas for taking it forward by adding first-person voice to the other two characters instead of just staying with the single viewpoint. I always like it when they do that in books... and it adds some depth to the characters, too, to know what happened to them from their own viewpoint before they ever met the others etc. I've finished three books this week, maybe four.. and am starting on a new one. These ebooks go fast - which may be another reason I'm not sure I can form up the whole story in the space.. and keep paring it down. Daddy fell over and went for a nap after we got back from town. The face I get when I ask her how she's feeling this afternoon. I also spent about ten hours over three days painting the holiday murals at my store. I think they turned out good - but there are more additions others have to make now to put everyone's ginger bread people in (with employee names) and a suggestion for more 'gifts' for other managers other than the Zebra that came up while I was painting. I have two 11x14 paintings now.. a few more to be made after I buy some more paint this week. I'm hoping to go make the cookies now. We decided to stay at home all day and try to keep warm and occupied. I've wrapped the gifts I have so far for Mark's birthday. There is still something coming in the mail and something Esme wants to get for him. We went out to an event for Esme's school district this afternoon, with G and her mom. It was a winter carnival type thing, indoors with games and activities. The girls had a fairly good time - Esme a bit more. She made an ornament to hang on our tree. Then we went and looked at a house they are fixing up, to see about the plumbing situation at it. Esme and I have a package of cookies to make tomorrow. I finished reading 'Tales of a Traveller' and the sequel, both by NJ Layouni. I put up a Niume book review about it. The first book, Hemlock, was free at Amazon. I've also been working on the Christmas project, and did a first stab at painting the slightly abstracted tree painting I was thinking about. It didn't turn out badly. I'll see if I have patience/inspiration enough tomorrow to make a second try at it. Just about ready for Mark's birthday - have to wrap some things, and Esme has to pick up what she intended to buy for a gift. I have tomorrow off, but then work all week until I have next Sunday off after that. The Christmas project is going along well. I've decided to build the toy instead of buy it. Most of the ones in this class available are for younger children, and shorter than would be useful for Esme. There are a few 'her size' out there, but they get into the hundreds of dollars and as Mark and I talked about the other night - she probably won't be wanting it for more than a few years. We decided to spend the money on some thing she would use longer. But, I still wanted to build her one, even if it will only survive for a year or two. So, I've been using what we have on hand, some cardboard, pvc pipe pieces, a storage bucket, wire, magnets, glue, paint etc... All that would cost money, too, except that we have it already and it is sitting around unused. And I think it is turning out okay. We're also encouraging her to watch and participate in cooking more (hint hint), and buying a few more cookbooks. I made biscuits for the first time in a long time last night, from scratch, and they turned out pretty good. I had one of the leftover ones this morning smeared with butter and maple syrup. I'm trying to collect the best basic recipes to make a 'goto' book, like we had in my mom's cupboard at home. I was Esme's age when I began to make parts of the meal on a regular basis, biscuits, macaroni 'hotdish', rice, gravy, cake etc.... She can make scrambled eggs, corndogs and cook things in the toaster oven, but she's still afraid of it. She is usually willing to watch me do it step by step. I want to transition her from 'me' to 'you'... but if she doesn't see me do it enough she won't feel it is a necessary skill. There might be a day for her - in all likelihood will, that she doesn't have the ease of going and picking up whatever she wants to eat whenever she wants it. And it's better to learn earlier than have to struggle through it later. Esme and I are halfway through 'Wildwood'. We've just gotten to the part where Prue is meeting with Owl Rex and finds out about the Dowager Governess' past.... creepy! Took a walk to the lake with the little camera (Cupcake) today. More pictures at the Niume post "Gathering Inspiration". When I get a little more time off (coming up this week) hope to sketch some of these ideas in paint. One of the grass shots (in the post) is really spectacular. These two are a few little bonus images from the camera roll... I like the way everything is 'reaching up' in the pic below, and the little tendrils of vine curling around the twigs up above. Esme helped with all of this! See article above. We're getting ready for the big day tomorrow! Esme and I have planned and gotten ready our clothing. We took Grandma out today and she got her own groceries and some things to add to the feast. And we are making dragon pork spice and porkchops for the meal and to bring to our friends afterwards. please go to the link to see the photo essay laid out. At the end of the second page there is a link to my earlier photo essay on how to knit on from there. The weather is getting truly cold... and it is even harder for me to keep myself out of bed after the school bus than it was when the air was warm. I took the little camera 'Cupcake' as Esme calls it, to town with me and grabbed a few shots during my lunch break - I couldn't go far, I still really wanted to sit down and eat. I grabbed this rather blurry image of the owls in our store Christmas tree and the shadows playing on the brick memorial outside. The camera doesn't do very good detail shots, but it does capture shadows nicely. This is the memorial at Lowes, for people who have worked with us previously but have passed on by accident or disease before their time. I knew the bricks would be showing gradient shadows because of the angle of the sun, and it might be a good painting challenge later. Whoever put the fake owls in there - they are interesting. I finally ... finally... finished 'Written in My Own Heart's Blood', by Diana Gabaldon. It is the last of the available Outlander books. It feels like I've read this series forever, but I did like it. Then, in almost one day, I finished an Outlander 'copycat', and am onto another. Well, they are steamy, that is for sure. The second one is at least more story, kind of like 'It's a Wonderful Life' meets Outlander where Fate and the angels have a hand in sending her back into the body of a woman who otherwise accidentally died. It's called 'Time for a Highlander'. Very silly, anyway, though. Time to go warm up and get ready - I work tonight, then three days off for Thanksgiving, then a very Black Friday... I really hate it, but we have to ALL be there.. so we make the best of it. I got myself into a predicament this morning, and confessed it all in the post above. The kind folks at Douglas Auto in Huntingdon ,TN came to my rescue. I'm going to get out my paints now and work at actually doing what I had been out there to take photographs for! This was a good effort - 9x12 on paper. I broke out the new bottle of Barn Red I've been reserving. I need to buy a new bottle of Fuschia, too - if I'm going to paint anything like the below! Esme was styling her pink hat and gloves today, diving through leaves and feeding her chickens. Esme also named my camera today, the small really old one I carry 'out' and about. (that took all these photos). She says it's name is 'cupcake', because that is what the shutter sounds like to her. That works. Me and Cupcake will be going out and about more often.. but hopefully not in any more ditches! I've been feeling this a lot lately... in my goals on making a little extra money for the holidays... in things at work that I've been asked to do outside my comfort zone, in my renewed promise to continue in my art. The radio station in my brain tuned to 'motivational speaker' is working a little louder lately. Next month is one year since I started to write my book... and it has three chapters done. That is on my mind, too.. but it is still saying 'don't push' on that... The Niume challenges and the art are helping me get to the point where I'm ready to take that back in hand and edit it one more time.. find out where the story goes next. I started out trying to paint something difficult that I already had a picture of on my computer - and I came up with this photograph of Esme, eyes down, shadows defining her face. I took on a hard subject - I noticed halfway through the sketch.. but one I cared about doing well. After the pencil sketch wasn't quite what I wanted (and Mark said the shadows were very stark), I continued over it in acrylic paint. I might have to try a grid transfer technique to make a larger one. Or, I might just go and do a portrait of Lucy (Esme's dog), to continue on the stretch and come back when I've learned a bit more again. This image came from Google Maps - and I wandered street after street around Nice, France until I landed in front of this place and said 'That's it.' The colors of the chairs and the buildings (which were very similar to shown) and all the little railing and window details cinched it. I think I spent about three hours on it last night, finishing just before midnight. I pushed myself and wasn't 100% happy with the result (mostly the motorbikes) but was extremely happy that I finished it entirely and didn't give up. That last stroke when you know its done... that feels nice. I can see a common style emerging again, and have noticed a few things about my painting process that rings bells with years and years ago. 1.) I tend to use one brush throughout. 2.) My color choices - even when trying to be true to life - tend to cluster around a few specific hues. The temperature is really dropping lately! It's cold! I got Esme a new sweatshirt and am focusing on making sure she has warm things to wear for the next few months. She is so happy to have her birthday boots. Now I am going to kick my tail into crocheting some new winter hats while sitting warmly in the bed with the rest of Written in My Own Heart's Blood by Diana Gabaldon.